Made from unique Maxeon solar cell technology, our new solar panel boasts a 22% efficiency rating (the ratio of energy output from the solar cell to input energy from the sun) making it one of the highest performing portable solar panels on the market today. As an added bonus, by using one of the provided connector tips or the DC Input Cord of the Freedom or C-100 Battery Pack, you can use the Freedom Solar Panel to charge other batteries or small electronic devices that operate from 18V or less. 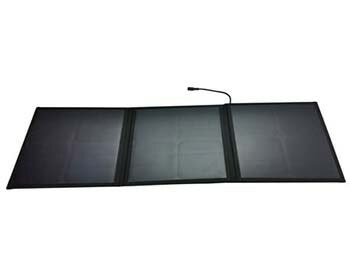 Cell Type: Freedom Maxeon® Solar Cells Panels: 3 Flexible Folding Panel Efficiency Rating: 22% Rated Wattage: 40W Output Voltage: 18V Open Size: 33.5" x 11" x .02" (L x W x H) Folded Size: 11" x 11" x .5" (L x W x H) Weight: 2.2 lbs Color: Black Charge Time: Charge times will vary depending upon the amount of direct sunlight that hits the solar cells. In optimal charging conditions the Freedom or C-100 CPAP Battery Pack can be recharged by the Freedom Solar Panel in approximately 4-5 hours. Freedom 40W Solar Panel for CPAP Batteries Discounts Apply ! Does the Freedom Solar Panel hold a charge? The solar panels only produce power when exposed to sunlight and that power is not stored. How do I obtain maximum output from the SunPower Solar Panel? Is the Freedom Solar Panel waterproof? 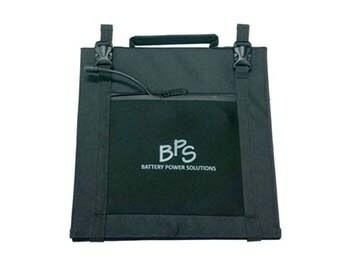 The solar panels are weather-resistant and will not be harmed if exposed to rain or snow; however, the connection cord is not weather-resistant and must be kept dry. The SunPower Solar Panel is not designed for continuous outdoor usage. 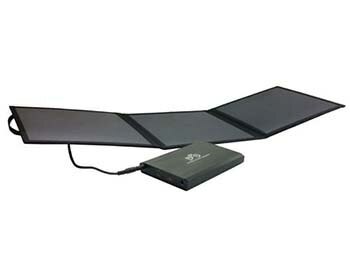 Once you charge your device the SunPower Solar Panel should be folded and stored in a clean, dry area. Can I use the Freedom Solar Panel to charge other small electronic devices? Yes - as long as the device you want to charge operates from 18V or less and has a DC power cable. You can connect your device to the SunPower Solar Panel using the included DC input cord. You may also use a solar charge controller, which can be purchased from electronics retailers, to connect your device to the SunPower Solar Panel. Please note that the SunPower Solar Panel does not have an internal charge regulator as that is a feature of the C-100 CPAP Battery; therefore, it is important that you read the charging instructions for your device as overcharging may damage your device's internal battery.